Composing my blog post yesterday started out as a major venting session about a few of life’s irritations that had me grinding my teeth in frustration. But I eventually abandoned my complaints post. Everything I tried to complain about led to a good experience or at least an interesting learning experience. Even though I am no longer going Biblical and gnashing my teeth, I do want to air a couple of aggravations. Posting yesterday about the musical Singing in the Rain led to grumpy old lady thoughts about my change in movie-going habits. 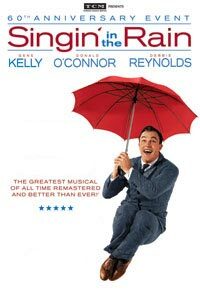 Singing in the Rain was the first movie excursion for my husband and me since well before my stroke last year. The audience was courteous and everyone there was enthusiastic and either a fan of the movie or they accompanied a fan they cared about. My husband and I rarely go to movies these days. We lost our enthusiasm many years ago when going from dark to bright sunlight following the matinees that we usually enjoyed would cause hubby to experience severe headaches. Sunglasses and other measures didn’t help. About the same time, two other circumstances came into play, and we gradually moved on to other avenues of entertainment, like raising two boys, attending their sporting events and replenishing the larder daily to keep hungry male teens from chewing on the furniture. One--Old-fashioned courtesy began to erode in theater audiences. Two--Entertaining, family-oriented movies with clean language and interesting characters who had or who developed any common sense and sense of decency were no longer as readily available. Singing in the Rain definitely drew an old-fashioned, and mostly old, audience. I suppose I am now officially a grumpy old woman. But I am a really, really happy grumpy old woman. I have been having trouble lately commenting on some new-to-me blogs as well as long-time favorite blogs. The blogs I have difficulty with are all blogspot.com. But I don’t have the commenting problem with all blogspot.com blogs. I have no trouble typing the comment into the appropriate box. But nothing happens when I click “Publish.” Sometimes a message in red appears under the comment box that says choose a profile, but there is no way to do so. The only click that makes something happen is the “Sign out” button. But that doesn’t further the process of publishing the comment. I have been leaving a comment via email when there is an email address, but not every blog owner provides an email address. Joared is a newcomer to my blog. I have appreciated her comments and recently visited her blog Along the Way. Hers is just one of the newcomers’ blogs I will be reading with no way to comment. If anyone has a solution to my commenting dilemma, please share. This is likely something I need to fix on my end, but I have no idea what or how. In the meantime I will just be reading and lurking if I can’t find a way to comment via the blog or email. I used to have trouble commenting on certain blogspot blogs, too, but after clicking on the other options for commenting, it did go through. I have never had trouble with wordpress blogs, though. Wonder why. email me the address to the two blogs and let me see what happens when i comment. I went to a movie in 1984, and 3 in the past 28 years. i rather watch at home and have only the four of us and if i don't like it i can turn it off. besides spending money that it cost now and putting up with the rude people, i just rather be home. i have turned into a homebody and love being one. just wish i had loved being a homebody when my kids were little. Sometimes the only way I can comment on a blog is to do it through google - ie I have to be signed in and it lets the comment go through. The only trouble is that I am not sure if the blog-writer actually recognises who I am! Re health: you have been an inspiration to me and I enjoy reading and catching up with your exploits. You've made me want to watch Singing in the Rain again - thank you. I had heard that people had trouble commenting on blogspot blogs as well, but not until I finally migrated to Wordpress and got a small deluge of comments the first day from people I didn't recognize! I had no idea because I'd never heard a word of complaint from anyone, and now that I'm no longer on blogger, I can't really investigate. So I'm afraid I can't be of any help at this juncture but to empathize, though I would say that I didn't have trouble leaving comments when signed into my google account. And am I wrong in thinking this is a google-hosted blog where you would be able to signed in from? I'm at a loss to know why you are unable to leave a comment since I can't picture in my mind the page you see. I did receive Sondra's comment. I know when I go to most Blogger pages I have to select Google, then clear to the right of the page I have to provide my user name and password. The comment automatically prints on some blogs, others have to then approve the comment first before it publishes at some later date on their blog. I have a lot of trouble with WordPress -- had no problem for a long time, then suddenly started having problems there, but only on certain blogs. WP has really become a pain on several blogs for me. Yes, send an email if you prefer. My address is under Contact on upper right sidebar.